Before you start filling my inbox full with hate mail, think about it. 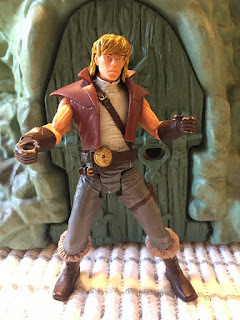 The original Prince Adam figure was just a quick repaint of the actual He-Man figure in a white shirt and purple underpants. You're not exactly hiding his secret identity well there, Mattel. One look at Adam and Webstor will figure out who he is in about 3 seconds and he's the dumbest of Skeletor's minions! So now you've got the most powerful man in the universe sharing a mold with what seems to be a Flying Graysons reject. Come on, now. So the beauty of this figure that we were given in 2003 was that Prince Adam resembled more of the boyish secret identity of our Hero. No big muscles, no 6 pack abs, no Lex Luger body by IcoPro. Nope, just a figure that looks more like a geeky IT director. With a sweet vest, a pair of tight slacks and sweet dishwashing gloves, Adam finally convinces me that he's a complete wuss and wouldn't be able to throw a rock through Man-At-Arm's window, let alone take down Skeletors entire army of monsters. Even if you're not a fan of the 200X series, you at least gotta hand it to them, they finally gave Adam a good figure. Come on, tell me that's not a vast improvement. It's like one of those "before and after" Milk commercials from the late 80s. So sad story, the Adam figure used was picked up at the famous McDonald House Sale last year, but someone decided he'd look better bald. 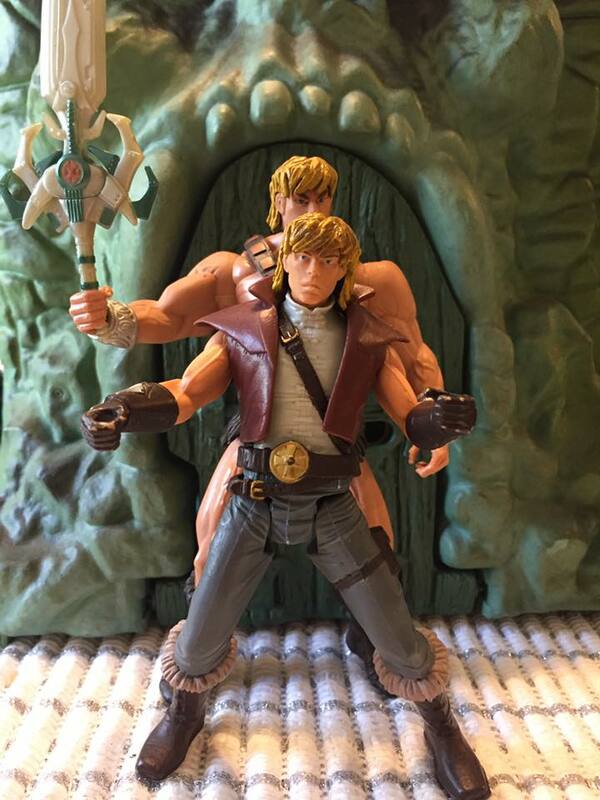 So thankfully a spare He-Man figure came in handy and I was able to do the old switcheroo. So if you see an Adam out and about with a different hair style, that's why. 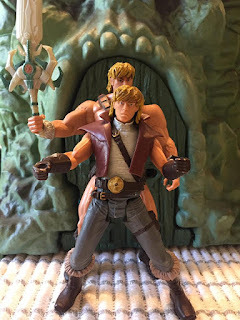 Which, now that I think about, negates my point about distinguishing the difference between Adam and He-Man and kinda makes me a hypocrite. Hmmm...Maybe I should've kept Adam looking like a skinnier Yul Brynner after all.